With the departures of Gary Cohn, Rex Tillerson and H.R. McMaster, Trump has effectviely purged his cabinet of globalists. “Come on dude!! !...end of the globalists !! !” crowed Steve Bannon, the deposed chief political advisor to the president and former Breitbart editor recently. Bannon’s schadenfreude — sent via text to a journalist at Axios — was specific to the firing of Secretary of State Rex Tillerson. But it could as easily have been referencing the resignation of National Economic Council director Gary Cohn, the troubles of Trump son-in-law Jared Kushner or the replacement of National Security Advisor H.R. McMaster with John Bolton. It's all “strictly business,” as the fictional mobster Michael Corleone would say. For Bannon, the self-appointed godfather of nationalism, news of these departures represents an almost complete purge of globalists from Trump’s cabinet. Predictions that moderates were winning the war for Trump’s ear now seem premature. Just a year after President Barack Obama left office, the White House has shifted solidly towards isolationism. How did America get here, and how have evangelists like Bannon turned a mainstream ideology like globalism into the far-right’s favorite smear? 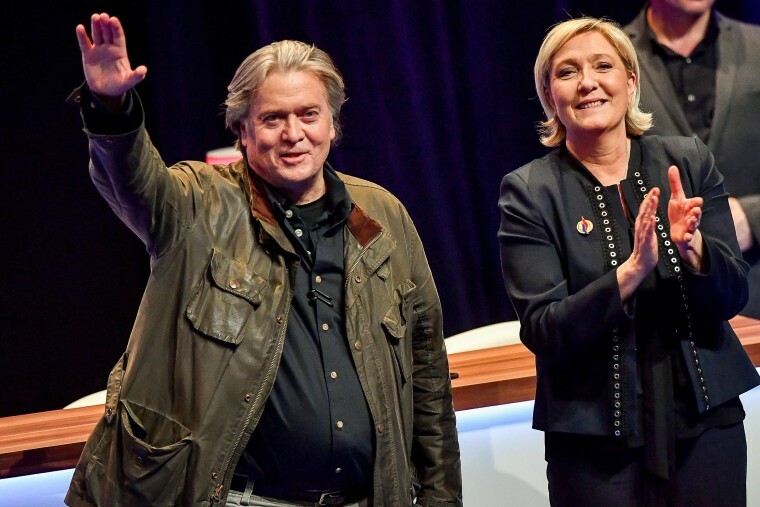 As author David Neiwert writes in “Alt America: The Rise of the Radical Right in the Age of Trump,” today’s anti-globalists are defined by their fear of a newly resurgent — albeit familiar – foreign tinged threat: “[T]he Enemy is always the same: namely, some variation on the New World Order, or ‘globalists,’ or any other term used to name the secretive cabal they believe is conspiring to rule mankind.” According to Anti-Defamation League Senior research fellow Dr. Mark Pitcavage, fear of this enemy is fueled by conspiracy theories about a tyrannical transnational socialist government intended to trample over the rights of Americans. While members in the purported cabal rotate somewhat, a key target for particularly bigoted anti-globalists is Jews. The term globalist is also “commonly used by white supremacists as one of many euphemisms for Jews, typically employed in an anti-Semitic conspiratorial context along with similar terms such as ‘international banker’ and ‘cosmopolitans,’” Pitcavage observes. President Donald Trump’s initial failures to mention Jews on Holocaust Remembrance Day, or disavow former Klan Grand Wizard David Duke; as well as his post-Charlottesville “very fine people” description of torch-wielding white nationalists and neo-Nazis emboldened supporters whose isolationism dovetails with anti-Semitism. (During the 2016 campaign, Jewish philanthropist George Soros was an oft-mentioned villain.) Moreover, Trump’s tweets also rebranded material from wholesome folks like “whitegenocideTM” — a “Jewmerica” resident. To be sure, this is not the first time America has viewed the outside world with suspicion. America’s wariness of “entangling alliances” dates back to George Washington’s farewell address. Washington’s warnings, however, were not premised on bigotry, but rather reflected a more straightforward strategy to avoid the recurring violent clashes occurring between empires across the Atlantic. Thus, the United States largely avoided international treaties until well into the 20th century, at which time America’s superpower status placed it at the top of an international order it once feared. Nativist fears returned with a vengeance almost 100 years ago, as a backlash over record immigration, Communism, international conflicts and shifting social mores propelled the Ku Klux Klan to its zenith of several million members members. Not merely an anti-black organization, it had expanded to embrace an increasingly anti-immigrant, anti-Catholic and anti-Semitic bigotry to attract new rural Protestant members in the heartland. At the same time, business icon Henry Ford’s four volume set “The International Jew” and the bigoted forgery “The Protocols of the Learned Elders of Zion” promoted international anti-Semitic conspiracies on an industrial scale. Following the collapse of the Soviet Union, the focus of the extreme right in the U.S. shifted to the subversion of domestic institutions by a revolving assortment of international players. Following the collapse of the Soviet Union, the focus of the extreme right in the U.S. shifted from an external Sino-Soviet Communist threat to a more nuanced one: the subversion of domestic institutions by a revolving assortment of international players. Much of this fearmongering was directed at those in power. President George Bush, a World War II veteran, invoked the term “new world order” during his Congressional address on September 11, 1990, applauding international cooperation against Iraq’s invasion of Kuwait the month before. Bush meant the term as a positive, but it didn’t take long before the anti-government patriot movement of the 1990s started using it to describe various conspiracy theories. Over the last decade, unease over terrorism, income stagnation, a diversifying demographic base and a divided social media landscape has reinvigorated talk of subversive global enemies. Obama’s election was an important recent turning point, as it lead to an increasing number of “mainstreamed” anti-globalist pundits like Trump, Glenn Beck, Pam Geller, Alex Jones and Steve Bannon claiming socialist or Muslim conspiracies were behind everything from immigration and health insurance legislation to the president himself. Over the last decade, unease over terrorism, income stagnation, a diversifying demographic base and a divided social media landscape has reinvigorated talk of subversive global enemies. For the first time in over a decade the United States has had consecutive annual increases in hate crime as well as disturbing spikes in those incidents targeting Jews, Muslims, Latinos and Arabs according to the FBI. The month of the 2016 election was the worst November for hate crime since the FBI began keeping track a quarter century ago; hate crimes against Muslims spiked immediately after Trump made his “Muslim ban” a key campaign promise. All this occurs amidst a backdrop of routine presidential malapropisms, diminished trust in institutions, declining life expectancy, a breakdown in race relations, and white Christians losing their majority status. These developments and profound socio-political divisions have been further exacerbated by an echo chamber social media landscape, which has in turn become increasingly manipulated and prone to conspiracy theories. The current deck chair reshuffling on U.S.S. Trump has catapulted numerous high-ranking “globalists” overboard. As a result, his administration is increasingly navigated by ideologues blind to, or potentially even approving of, the dangerous, bigoted undercurrents of a conspiracy driven by ethno-nationalism. Criminologist and attorney Brian Levin is a professor of criminal justice and director of the nonpartisan Center for the Study of Hate & Extremism at California State University, San Bernardino. A graduate of Stanford Law School and former NYPD officer Levin is the author, editor or co-author of books, academic articles and Supreme Court briefs.